Indiana's First Floating Cabins! 2-bedroom and 3-bedroom floating cabins available. Each floating cabin has its own 12' x 20' deck, gas grill, deck furniture, and private boat slip. Floating Cabins full? Rent a houseboat and leave it docked - it's just like a floating cabin. Check in at Patoka Station, right outside the main gate entrance (Newton-Stewart) to the state park. The Floating Cabins are located approximately 3 miles inside the park on Patoka Lake Marina's docks. DNR Gate fees apply. Summer prices in effect May 18 - September 9. Check-in after 4 pm, check-out before 10 am. The floating cabins are all on their own dock with separate entrance ramp. The kitchen comes fully equipped with all cookware, dinnerware and utensils. 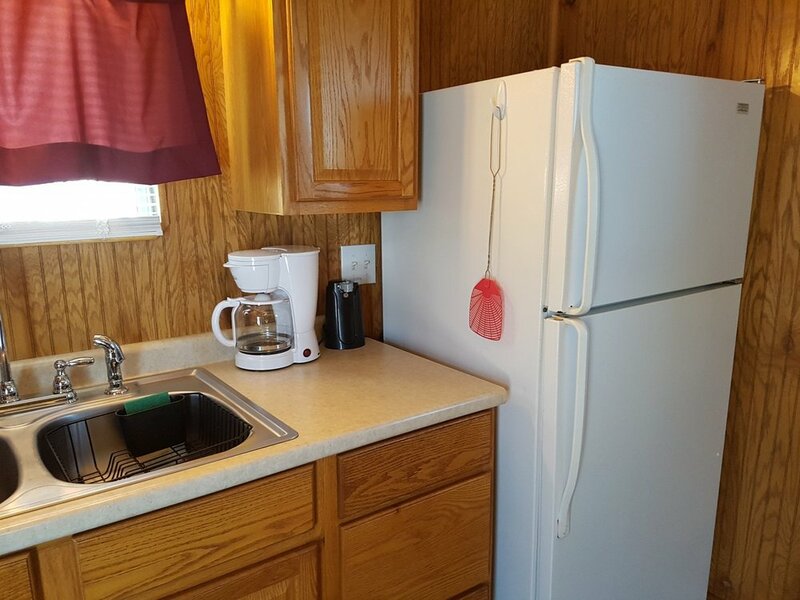 The full kitchen has a microwave, toaster, and coffee maker. The living room has a flat screen TV/DVD player. There is 1 upper state room with Queen bed, and 1 lower state room with Queen bed. There is 1 full bathroom. The full bathroom has a shower/tub combo. Floating Cabins each have a private dock area with chairs, picnic table and gas grill, plus a private slip. Floating Cabins and the Admiral houseboat are on their own dock with separate entrance ramp. Each floating cabin has its own dock area with chairs, picnic table and gas grill, plus a private slip. Living Room also has a TV/DVD player. The living area, dining area and fully equipped full kitchen are open to each other. There is one full bathroom with a shower unit. There are 2 lower state rooms, each with a Queen bed. The one upper state room is larger and has a sink.